An electrocardiographic-gated segmented fast imaging employing steady state acquisition (FIESTA) cine sequence (repetition time 4.0, echotime 1.7) in the horizontal long-axis view was used to evaluate the atria. 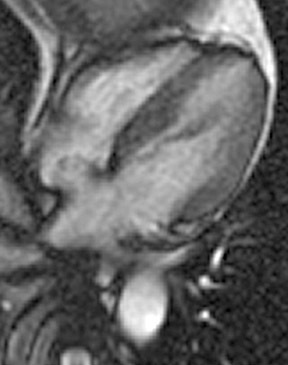 The MRI shows oscillation of the atrial septum into both atria throughout the cardiac cycle (Figure 1). The interatrial septum bulges into the left atrium at end-systole, moves to the midline at mid-diastole, and bulgesinto the right atrium at end-diastole. This is diagnostic of an atrial septal aneurysm (ASA). On MRI, the base of the aneurysm measured 1.9 cm. Maximum excursion into the right atrium was 1.3 cm and maximal excursion into the left atrium was 1.6 cm. No atrial thrombi were seen and no signal voids adjacent to the atrial septum were found to suggest the presence of a patent foramen ovale (PFO). Atrial septal aneurysm is clinically significant because of its association with cryptogenic stroke especially when there is a concurrent PFO. Approximately 70% of patients with ASA also have a PFO, while PFO is present in only 22% of patients without ASA. In one study, the combination of ASA and PFO was associated with a 33-fold higher risk of cryptogenic stroke.1 A meta-analysis has also found that ASA alone or ASA with PFO is associated with ischemic and cryptogenic strokes in patients <55 years of age. The strongest association is in those patients with both an ASA and a PFO.4 In patients <45 years of age with ischemic cerebral events, ASA should especially be suspected as a cardioembolic source. Mattioli and colleagues5 reported that 86% (43 of 50) of such patients had an ASA as the only possible etiology while 97% (42 of 43) of these younger patients with ASA also had a PFO. On cine bright-blood MRI sequences, ASA can be easily diagnosed. The phasic excursion of the atrial septum throughout the cardiac cycleis readily apparent. If present, a signal void extending from the ASA into the left atrium would also indicate an associated PFO. Contrast-enhanced dynamic MRI with Valsalva has also recently been shown to be useful in the diagnosis of ASA and PFO.15 If echocardiography is inconclusive for the diagnosis of an ASA, MRI is the imaging study of choice for further evaluation. Atrial septal aneurysm is a congenital cardiac abnormality characterized by oscillation and aneurysmal bulging of atrial septal tissue into either or both atria during the cardiac cycle. Roughly 70% of patients can also have a PFO, placing them at increased risk of cryptogenic stroke. 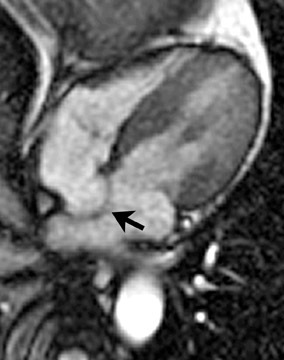 Atrial septal aneurysm is easily recognized with cine bright-blood MRI sequences. Cabanes L, Mas JL, Cohen A, et al. Atrial septal aneurysm and patent foramen ovale as risk factors for cryptogenic stroke in patients less than 55 years of age. A study using transesophageal echocardiography. Stroke. 1993;24:1865-1873. Hanley PC, Tajik AJ, Hynes JK, et al. Diagnosis and classification of atrial septal aneurysm by two-dimensional echocardiography: Report of 80 consecutive cases. J Am Coll Cardiol. 1985:6: 1370-1382. Olivares-Reyes A, Chan S, Lazar EJ, et al. Atrial septal aneurysms: A new classification in two-hundred five adults. J Am Soc Echocardiogr. 1997;10: 644-656. Overell JR, Bone I, Lees KR. Interatrial septal abnormalities and stroke: A meta-analysis of case control studies. Neurology. 2000;55:1172-1179. Mattioli AV, Aquilina M, Oldani A, et al. Atrial septal aneurysm as a cardioembolic source in adult patients with stroke and normal carotid arteries. A multicentre study. Eur Heart J. 2001;22:261-268. Wu LA, Malouf JF, Dearani JA, et al. Patent foramen ovale in cryptogenic stroke: Current understanding and management options. Arch Intern Med. 2004;164:950-956. Belkin RN, Kisslo J. Atrial septal aneurysm: Recognition and clinical relevance. Am Heart J. 1990;120:948-957. Wilmhurst PT, Nightingale S, Walsh KP, Morrison WL. Effect on migraine of closure of cardiac right-to-left shunts to prevent recurrence of decompression illness or strokeor for haemodynamic reasons. Lancet. 2000;356:1648-1651. Mohrs OK, Petersen SE, Erkapic D, et al. Diagnosis of patent foramen ovale using contrast-enhanced dynamic MRI: A pilot study. AJR Am J Roentgenol. 2005;184:234-240. Atrial septal aneurysm. Appl Radiol.